As we all know, Labor did not only vin the Victorian election on the weekend. It was a landslide, decimating the Liberal Party and leaving it with barely 30 percent of the vote. This is huge in the Australian context, where the two-party system has been cemented in for a long time, and votes seldom shift by more than a few percentage points. The politics of hate and division has been soundly rejected. During this election, it took the form of promoting the fiction that Melbourne has become a virtual war zone, and that its authors are needed to bring in a new era of law and order. They were sent packing. Their campaign was a follow on from the campaign against African gangs, firstly manufactured through Rupert Murdoch’s media outlets and then taken up by the Turnbull and Morrison governments. They pretended that Melbourne people were too afraid to leave their homes. The problem with this line of argument was always going to be that those who live in Melbourne know better. Undaunted, Scott Morrison weighed in with a disgraceful attempt to brand the tragic Bourke Street killing as an act of Islamic terror. It backfired. The obsession is tied to the rise of the new radical right in Australia and in the Liberal party. Its core is within the ranks of those who hold economic and political power in this country, in conditions witnessing an ongoing dysfunctional economy and loss of faith in traditional politics and those who espouse them. Politics of hate and division is a tool to deflect rising anger, by finding scapegoats to blame all ills on. The rejection of this by Victoria is testimony to a rise in political maturity. With it comes a call for politics that moves in the opposite direction, builds community, is inclusive and fairly distributes the fruits of the work of all. The Andrews government won credit, above all, for increased infrastructure spending that is bringing benefit to the whole community, and new investment in the TAFE system. There is a lesson in this. When a government does things seen as benefiting the majority and not just a minority, it gets community support. Victoria’s election had some negatives as well. There was a ganging up on the Greens. Behind the scenes there were undemocratic deals and preference swap arrangements, designed to counter the will of voters. For instance, where the Greens have a major presence, it was assured that the bulk of the second preferences went to Labor . It wasn’t only the Liberal Party. Some of the micro parties got entangled in to get seats though the back door.although they have virtually no support. For instance, the Taxi Drivers Party got a seat in the upper house with only 0.6 of in proportion to its votes, and displaced the Greens, who got 9.3 percent. Derryn Hinch’s party gets well over represented in proportion to its vote. The Nationals get a swag of seats, with barely over 5 percent, and the Greens only one with around 10 percent. Overall, the independents attracted 11.5 percent of the vote, but this was nowhere near reflected in the allocation of seats. The democratic credentials of the existing electoral system are limited, and the way some can manipulate it, diminishes then further. Despite the challenging times, the Greens did not do as badly as some of the commentary would lead us to believe, and they are well positioned to bounce back. This election raises a very important matter. The greatest threat in our time is the politics of hate and division. Although they received a setback at this round, the fight is far from over. The merchants of the politics of hate and division will regroup and recommence their assault. Australia needs to pull out all stops to build an invincible counter force, and this can only be achieved through the building of the broadest possible unity for the common purpose of putting an end to the politics of hate and division. The underhand methods used in this election do not help and it is time to work out who the real enemy is. As the biggest party, a special responsibility falls on Labor. The Greens and others must also play their part. Truth is, there is considerable ground for unity. There can be some accommodation. There can be a stop to the use of name calling to undermine reputations and false accusations. 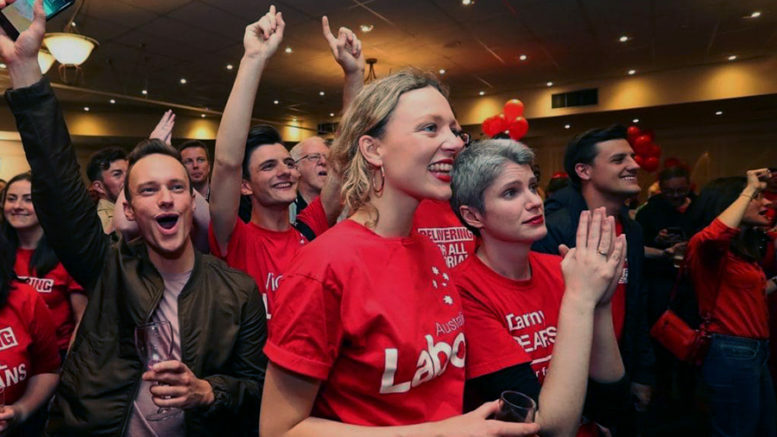 There can be a decision for Labor to allow the Greens gain seats in some places, and for the Greens to return the favour in other places. There can be an effort to get the members and supporters of both and other parties and individual to work together in the local context of organising the Australian community as a movement for positive change. The good election result has brought an opportunity to move forward. The question is, will it be taken up? 2 Comments on "The lessons of last weekend’s election in Victoria"
Definitely agree on most fronts, but the Bourke Street killer was admittedly inspired by IS, so it’s not wholly inaccurate to consider his actions to be of Islamic terror. The question is now that the labour party has a convincing majority, will they become arrogant and ignore the peoples wishes more than is the case where the majority is small? They have done good things re infrastructure and so on, but fail miserably on very serious, long term environmental issues. They have failed to take a stand to stop the Adani mine proposals and the like. This is the world’s most important issue, the trend toward global fascism being the second. Regardless of any political system, to stuff the environment is to bring about the eventual end of the world as we know it, possibly even the end of mankind. That is the potential of where we are at today.